Team USA's Gold Medal performance in the American games and therefore qualifying for the 2008 Olympics in Beijing has inspired me. Not in the way that Miracle on Ice inspired me, but still. So for today's Friday Flashback I thought I'd go 1984 Olympics on you. The first two pictures (above and below) come from my collection while the others come from eBay. 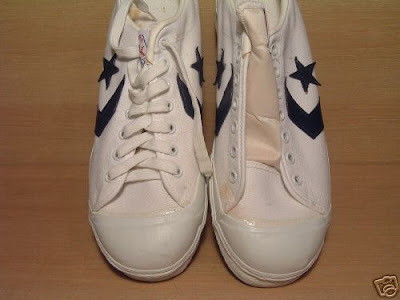 I must also say that there is a difference between the two different pairs. 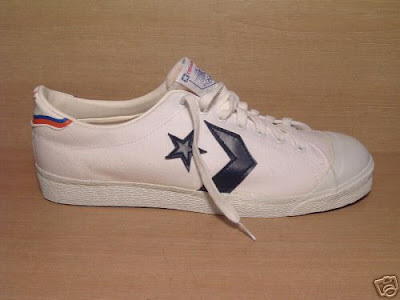 Mine actually have LA84 in gold on the Chevrons. 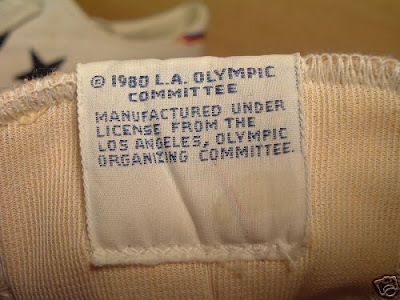 However in the pictures below you will not see the LA84, from reading the description on the eBay auction these shoes were samples for the Olympic Committee. Minus that little detail the shoes appear to be identical. One feature I really enjoy in this shoe is the sweeping toe cap. In the pictures above and below you can get a good look at what I am talking about. I like how it carries over to the sides of the shoe and connects to the sole. 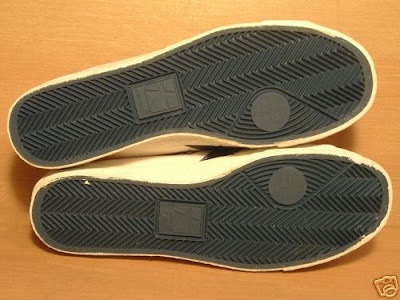 Below is a picture of the outsole of the shoe. It's nice and simple, but I really love the use of the Star in a Square logo. This one is in the late 70's early 80's with sharper edges for the square and the star. The use of the Olympic logo on the heel tap and tongue is very nice touch. Everyone once and a while you'll find a pin floating around on eBay with this same design. 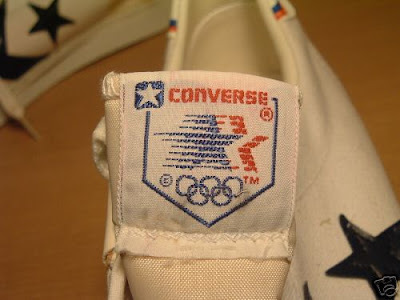 Converse was one of the official sponsors of the 1984 Olympics in LA. Finally below is a look at the inside of the tongue the committee tag. 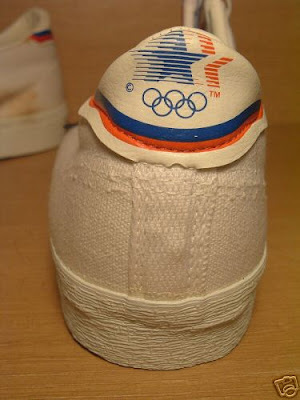 I am working on getting some more pictures from Magic and Bird's dream team shoes so maybe by the time Team USA takes the court in Beijing I'll have some more. Thanks for reading, and enjoy your weekends.